sunshine and whimsy. 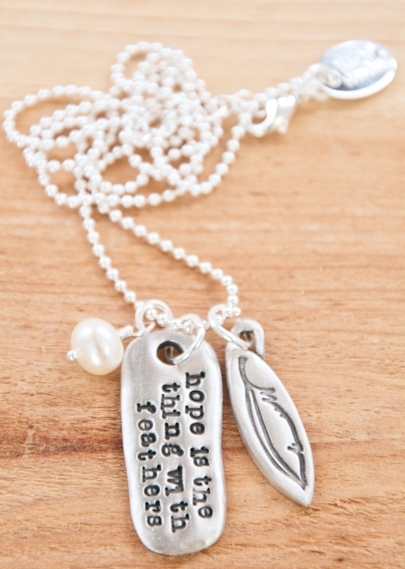 : hope is the thing necklace. hope is the thing necklace. I had my eye on a version of this necklace for months but it was always out of my price range. Then, Lisa announced that they would be offering a line of custom pewter pieces at prices that were more affordable. I was beyond excited when I realized one of the pieces was their "hope is the thing" necklace AND they were offering free shipping that week with a discount code. After much debating, I ordered it. The cost was still a bit of a stretch, but this necklace means so much to me. // Emily Dickinson's "Hope is the thing with feathers" is my favourite poem. // One of my two words for this year is "hope." "I wish I could make you feel as strong and as loved as you are. You'll find your way, because of that, and because you have the thing that so often wavered in me. You have faith. Not in God necessarily, but in the thing with feathers. You are brightness... You are hope. No matter how far down you get, you'll always have it." You see, my search for hope is a constant one. I know it can be found everywhere, but sometimes I have to try a little harder to find it. I know it is always with me, but sometimes I forget. This necklace is one more reminder that I always have hope.